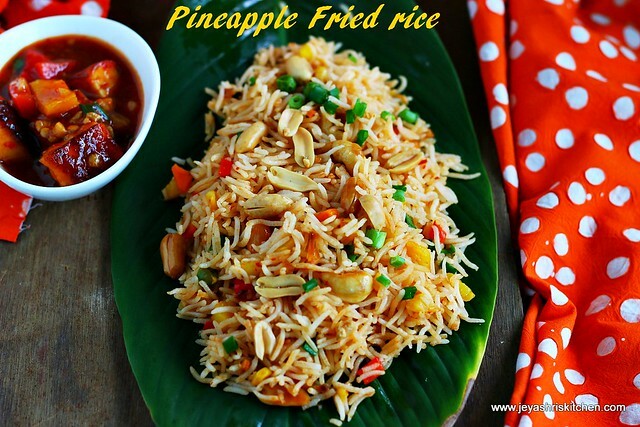 Pineapple fried rice, is a popular Thai recipe. I have seen this in a Thai vegetarian cook book which my friend gave it to me. Pineapple is a one of the fruit which we get throughout the year here in Singapore. 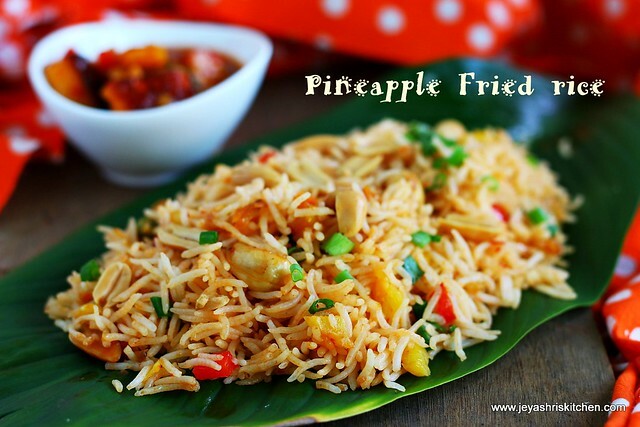 Every time when i but pineapple i wanted to try this Thai style Pineapple Fried rice. As today Varsha is at home, thought will make something new and interesting for her lunch. she always loves to try new cuisine. I made Pineapple fried rice and Schezwan paneer. Will post the paneer recipe later. This fried rice turned out very well . I made slight variation to the original recipe by adding little schezwan sauce to it. You can skip that also and make. *I skipped this as i added the schezwan sauce. Wash the rice and cook it. Ensure each grain is separate. Check out my post on how to cook basmati rice. Cook as per this method. You can use left over rice too. Spread the cooked rice in a plate. Chop the onions, garlic and ginger finely. Slit the green chili. In a pan add oil and add the chopped onions, green chili, garlic and ginger. When they start slightly brown add the cashew nuts and saute it for a minute. Add the veggies (corn, capsicum, peas and carrot) . I used frozen corn and peas. Chop the carrots and capsicum into small cubes. Saute this for 2 minutes in a high flame and add the soy sauce. Add the schezwan sauce if adding. Else skip that step and move on to the next. Mix well. Now add the pineapple. Cut the pineapple into small cubes and add it. Mix well and add the roasted peanuts to this. I have roasted peanuts with me. If you have raw one dry roast it in a pan separately . Phew the skin and add it to the rice. Now add the cooked rice to this and mix well. Cook in a medium low flame for 5 minutes and switch off the flame. Pineapple fried rice is ready to serve. Serve this as it as or with any manchurian gravy. If the pineapple is too sour, then add the spices accordingly. You can add few raisins while adding the cashew nuts. Always use firm ripe pineapple. Roasted peanuts gives a nice crunchy taste to the pineapple fried rice. So do not skip it. Pineapple rice looks so tempting, wish I could reach out through the screen to have it.